Due to the private function, HOOTERS SHIBUYA will be closed on Thursday, April 9th. Please contact the location directly at 03-6416-3917 for detail. New Weekday Lunch menu at the Osaka location! HOOTERS OSAKA will close from 6:30 pm to 9:00 pm on Friday, December 19th. 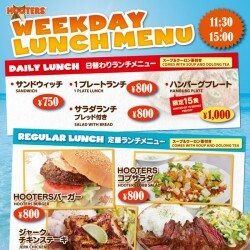 HOOTERS TOKYO will close from 6:00 pm to 9:00 pm on Thursday, December 18th.